Director – James Whale, Screenplay – William Hurlburt & John L. Balderston, Producer – Carl Laemmle Jr, Photography (b&w) – John J. Mescall, Music – Franz Waxman, Special Effects – John P. Fulton, Mechanical Effects – Kenneth Strickfaden, Makeup – Jack Pierce, Art Direction – Charles D. Hall. Production Company – Universal. Owing to the popularity of ‘Frankenstein’, Mary Shelley decides to write a sequel. In her story, the Frankenstein monster survives its burning in the mill. The eccentric philosopher-scientist Dr Pretorius discovers the monster and takes it in. Pretorious tries to persuade Frankenstein into building the monster a mate but Frankenstein wants nothing more to do with his cursed creation. Finally, Pretrorious blackmails Frankenstein into doing so by having the monster abduct Elizabeth. Frankenstein (1931) was a huge success, one that resonates and casts a huge shadow over the horror film even today. It made the name of Boris Karloff, even though Karloff was never named on the credits. (Here he is only known as ‘Karloff’, although does get top-billing). A sequel was fairly much mandated and so Universal returned to Frankenstein director James Whale who went away and cooked up Bride of Frankenstein. The result has been called by some the greatest of all horror films and is agreed on by most as being superior to the first outing. It is certainly one of the most oddball of all Frankenstein films. James Whale was a unique director. 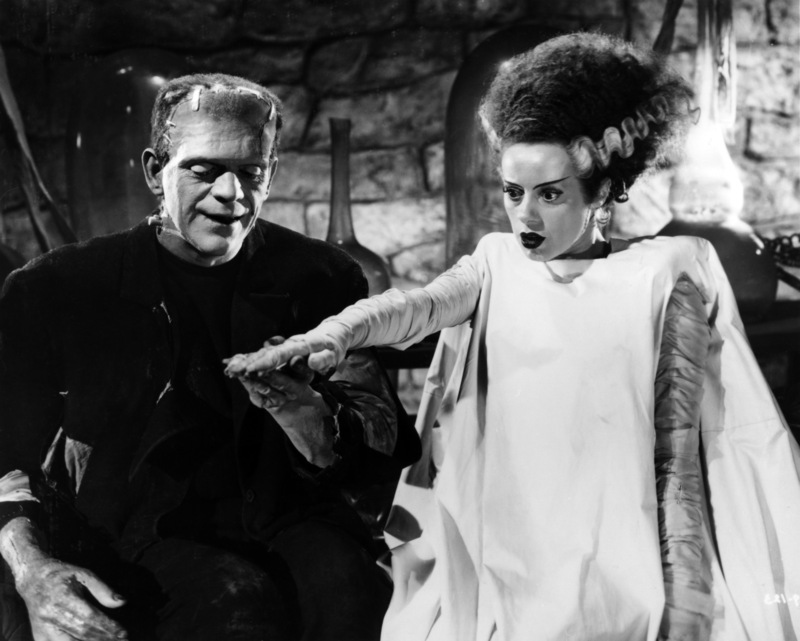 (A portrait of him and some of the scenes of the making of Bride of Frankenstein can be found in Gods and Monsters (1998), which actually takes its title from a line in this film. There have been some silly and unnecessary attempts to try and read Bride of Frankenstein as a parable amount Whale’s homosexuality). In the first film, James Whale subordinated himself to the story at hand. Frankenstein was a coldly measured film – one that showed Whale’s background as a stage director – and was directed toward being an elegant fright show. The film’s success allowed Whale a greater artistic freedom here and he takes the opportunity to allow his droll, eccentric sense of humour free reign – something that never emerged in Frankenstein. 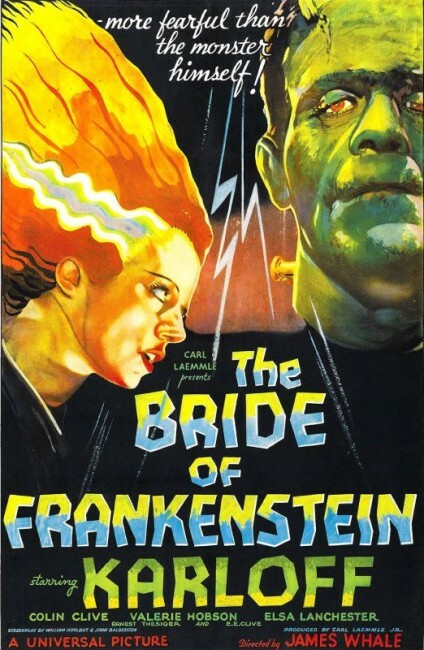 Bride of Frankenstein is now less of a horror film than it is a comedy – in fact, the exploits of Frankenstein are upstaged by Ernest Thesiger’s waspish, engrossingly lunatic Pretorius. The first meeting between Pretorious and monster in a crypt where Pretorious tempts the monster with a cigar – “Have a cigar. They are my only weakness” – is hysterical. Whale also has a far greater sense of mise en scene here than in the original. His treatment of the monster is a strange blend of pathos and humour. Out of Boris Karloff’s primitive mime there comes a genuine, albeit simplistic, emotion – it is quite something to watch the tear roll down his face when the bride rejects him, or the dull grave-stone voiced intonation “I love dead, hate living.” There is a strangely funny blend of poignancy and humour in the sequence (wickedly parodied in Young Frankenstein ) where the monster encounters a blind hermit in the woods who invites him in for dinner. The most startling introduction this time around is Elsa Lanchester’s bride. Lanchester gives a dazzling mime performance – all panicky bird-like mannerisms, when she screams her whole face opens up in an exaggerated silent-screen mime. There are cloying elements – particularly Una O’Connor’s whining Cockney maid (in the midst of Germany!!) and the unreal Pollyanna-ishness of the Mittel Europe setting with Heidi-like shepherdesses dancing through the forest, or the heavenly music that keys in when the blind hermit thanks the Lord for having delivered a friend. However, there is much greatness to James Whale’s eccentric production. The other Universal Frankenstein films are:– Son of Frankenstein (1939), The Ghost of Frankenstein (1942), Frankenstein Meets the Wolf Man (1943), House of Frankenstein (1944) and Abbott and Costello Meet Frankenstein (1948). The Bride (1985) was a loose remake, while the Bride is also wound in as a character in the tv series Penny Dreadful (2014-6).